The Majesty symbol and bandname are embroidered on the front of this well-made, durable backpack. It is thoughtfully designed with multiple checkpoint-friendly clamshell openings and an interior, padded section to safeguard your laptop and/or tablet. Other features include multiple interior and exterior pockets for other items, and rugged ergonomic, adjustable padded shoulder straps. Interior laptop sleeve dimensions are 12” tall x 12” wide x 1” deep, which easily fits most 15” laptops. 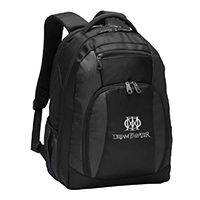 Backpack dimensions are 17” tall x 12” wide x 8” deep (a generous 1,632 cubic inches).